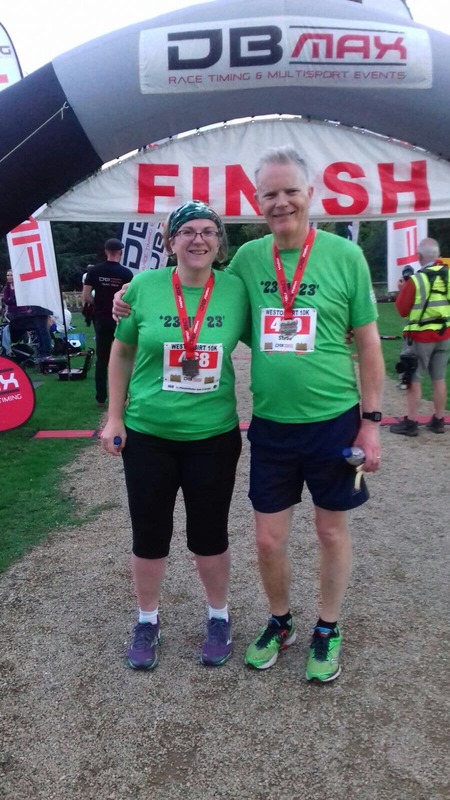 This week it’s Celia & Steve Randerson who took part in the Westonbirt House 10K with us. ‘Steve and I have been running for a few years and we have both in the past completed half and full marathons. In June 2016 however our lives were turned upside down with the news that Steve was diagnosed with Stage 4 kidney cancer. Unfortunately, by the time it was discovered it had already spread to his lungs and from the off they were talking of containment rather than cure. Despite this devastating news, Steve has remained incredibly positive and has continued running – In fact we have just finished a challenge to complete all 23 Welsh parkruns in 23 weeks for 2 cancer charities to say thank you for the support and treatment they have provided so far – Velindre Cancer hospital in Cardiff and Macmillan Cancer support. Despite Steve’s health issues and maybe because of them, we set ourselves this challenge for the first 5 months of 2017. Beginning on 31 December 2016 at Llanelli Coastal parkrun, the tour has taken us as far West as Aberystwyth and as far North as Bangor and lots of places in between. The 23 in 23 challenge raised an amazing £10,000 so far for those 2 charities and we wore our 23 in 23 shirts whilst completing the Westonbirt House 10K.